“The Turin Horse” and “Jeanne Dielman” are my ideas of cinematic bliss. When frustrated viewers complain that “nothing happens” in a movie, save me an aisle seat. 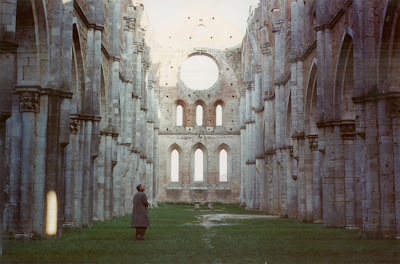 By that standard, Andrei Tarkovsky's “Nostalghia” (1983) should be a natural fit for me. Long shots of immobile people staring at the camera and ten minutes of a man walking back and forth while holding a candle? Sounds awesome. 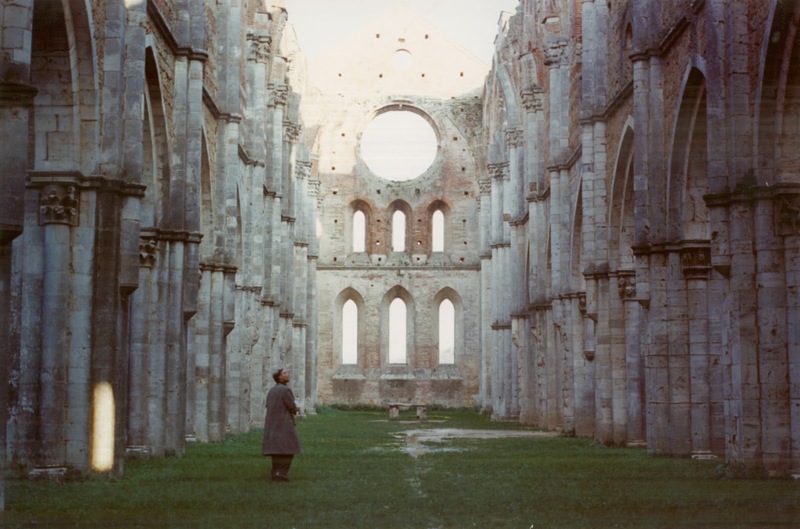 Yet I find “Nostalghia” largely impenetrable, and not necessarily in the usual rewarding way. Conceptually, it's not too difficult to grasp. 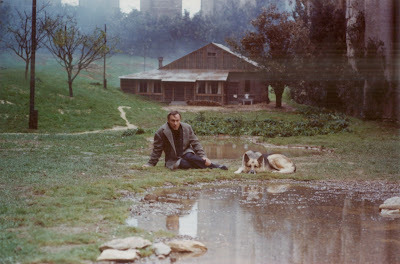 Tarkovsky was living in self-exile in Italy and the great Russian director wanted to make a movie about “the melancholy that arises from being far away” from the homeland and family. Coincidentally enough, the protagonist of the film (with a script by Tarkovsky and frequent Antonioni collaborator Tonino Guerra) just happens to be a Russian poet named Andrei (Oleg Yankovskiy) doing research in the Tuscan countryside on an 18 century Russian composer who committed suicide there; yes, you guessed it, it's a light-hearted romp. Andrei splits time between obsessing over his project and reminiscing about his family back home in flashbacks shot in grungy black-and-white. That's all straightforward enough, but it's the details that sometimes baffle, particularly the opaque relationships between Andrei and the film's other two major players. Eugenia (Domiziana Giordano), his young translator and guide, initially appears put off by Andrei's self-absorption, but suddenly begins screaming furiously at him for not making a pass at her, causing the detached intellectual to categorize her as “insane.” Stranger still is local eccentric Domenico (Erland Josephson) who resists speaking to Andrei initially, but then unleashes a torrent of pseudo-apocalyptic ranting that apparently has a profound effect on our protagonist, but remains enigmatic for everyone else (or at least for yours truly). As usual in the director's work, there's water, water everywhere with rain equally as likely indoors as outside, and the film is chock full of steam-bellowing spas and fog-enshrouded vistas. This is one of the moistest movies you've ever seen. Dark spaces on screen are ever-so-gradually illuminated, and vice versa, and the camera always meticulously tracks the action, or inaction. The sense of atmosphere is both palpable and palpably sad. The net result is perhaps the most self-consciously stylized Tarkovsky film, providing an inherent challenge and potential reward to viewers. The key to appreciating movies where “nothing happens” is to tune in to their wavelength and let the mood envelop you at its own languid pace. If you're tuned in, you may well have a stronger emotional response than you get from films that rely on traditional narrative tension and pathos. Viewers may experience the same kind of reverie-state as Andrei and lose themselves completely in the rich, tactile world of the movie. If you're not tuned in, the terminal solemnity can strain both credibility and patience. “Nostalghia” could well play as a kind of art-house parody with its gallery of glum faces and frozen tableaux, its proud reliance on pregnant symbolism, frequent switches from color to black-and-white, and the blasts of Verdi and Beethoven heard at cathartic moments. It's hard to know what to make of these characters engaged in deep, deep thoughts and their mysterious and deep, deep interpersonal exchanges. Do we have any reason to care about the limpid Andrei? Is Domenico anything more than the tired cliché of the lunatic who sees more clearly than the rest of us? Tarkovsky's record guarantees that the filmmaker deserves the benefit of the doubt, but don't feel bad about not quite getting it. A second (or third or fourth) viewing might be required, and will surely be well worth it. I know I'll be circling back to this to see what I missed the first time through. The film is presented in a 1.66:1 aspect ratio. The transfer is described as “newly mastered in HD from archival 35 mm elements” though it's unclear how much, if any, restoration has been involved. Image quality is fairly strong with an appropriately muted color palette, but a surprising amount of damage is visible with flecks and speckles visible in most shots. It's slightly distracting, but certainly not troublesome enough to interfere with the viewing experience; it seems a bit much from a film that's only 30 years old, though. 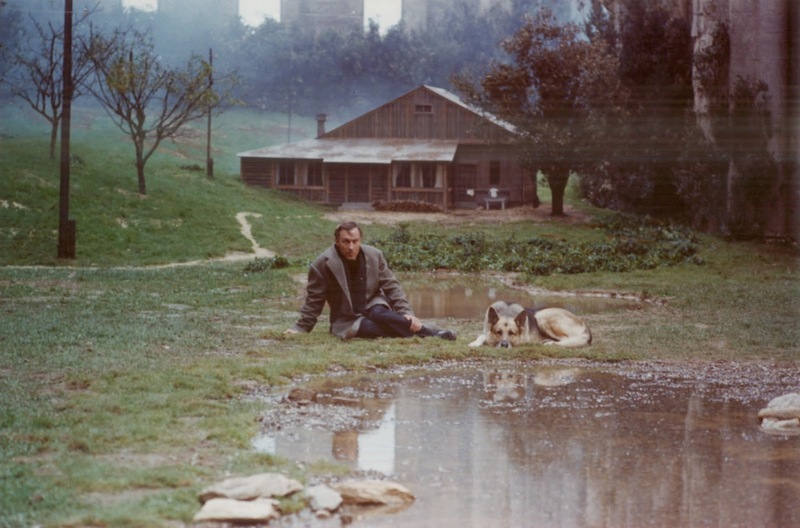 “Nostalghia” was Tarkovsky's penultimate feature, and has generally not been accorded quite the same status as the films between which it is sandwiched: “Stalker” (1979) and “The Sacrifice” (1986). I can't argue. It's probably my least favorite of his, but every Tarkovsky film has improved for me on subsequent viewings, so I reserve final judgment til a later date. Kino Lorber's high-def transfer isn't immaculate and comes with no extras, but the image is solid enough and the chance to see any Tarkovsky in 1080p is welcome.